All existing customers can upgrade to this new version for half price. Simply login to your account and you will see the upgrade link there. 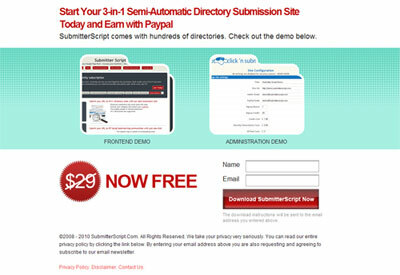 You may use give away the script on your website or CD but CANNOT resell it. We have released version 1.1 of PHP Dir Submit today. We recommend all users to login to their accounts to download this updated version. If there’s any feature you would like to see in the next update please tell us by using the contact form. If you have purchased the Single User License of PHP Dir Submit you can now upgrade it to the Developer License for just $50. With the Developer License, you can install the script on unlimited number of domains and also you can remove the footer credits. We have fixed the remote SQL injection vulnerability issue in PHP Dir Submit. This issue no longer exist in PHP Dir Submit and SubmitterScript. First, we would like to thank you for purchasing the version 1 of our script. We have received a lot of emails asking us when PHP Dir Submit will be released, so here’s our reply – Our team is currently fixing a few bugs within the admin panel of PHP Dir Submit (version 2) and compling the installation manual. We are expecting it to be released early this month. We will send email notifications to all existing customers as soon as the script is ready. Thank you for your patience. If you have any suggestions or comments about our script, please let us know by using the contact form on the support page. We look forward to hearing from you!